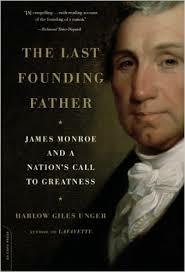 Harlow Giles Unger gives us a lively easy-to-read volume on President James Monroe here. His subtitle “James Monroe and a Nation’s Call To Greatness” shows his belief that Monroe’s presidency was great times for our nation. That Monroe was our last Founding Father is open to debate and may depend on how you define it. Had Mr. Monroe died before 1800, I doubt he would have been thought a Founder. In any event, he was the first Revolutionary War veteran since Washington, and for that matter, the last. A young man in Washington’s army, and one with close experiences with Lafayette, he was even seriously wounded in the line of duty. He loved Washington but came under the spell of Jefferson and became one of his protegees. To be fair, he was protegee number two after Madison. He had the same Virginia background as three of his four predecessors, including money problems, the typical troubles of one trying to be somebody in Virginia, and being a slave owner. Like them too he had some troubled family members. The difference was that he was not really born into this life and aspired to it, including the slavery. He left nothing for us to know his religious beliefs. He career as Virginia’s governor and his time in France was productive. He showed initiative and had to make decisions in those days where communication across the Atlantic was so slow. Unger well highlighted his many accomplishments. The flaws of the book were usually to do with getting carried away praising Monroe. He paints an inaccurate picture of James Madison being incompetent and Monroe carrying him the last two years of his presidency. Besides Monroe he seemed to praise only Washington and even suggested Monroe was another Washington in many ways. A biography where the biographer comes to really respect his subject is often a good read, but this one got carried away. On the plus side, I left this volume feeling I had underestimated Monroe. He actually was one of the good ones. His time in office was greatly prosperous and he greatly aided the expansion of our country. His end in poverty and ill health was sad. There must be a better biography of Monroe somewhere, but it would likely have to work hard to be as entertaining as this one. Here is a pleasant read. Find other review in the series here.